It is the story of a young girl living in a city. This girl had average color and look. Since her birth, whenever she tried to play with her friends, she always felt that “she is very ugly and no one likes her”. However nobody used to pass any comments on her regarding her beauty but “she remained in full of inferiority complex and in depression”. One day, She observed that boys and girls were giving gifts to each other and wishing them with words “Happy Friendship Day”. Everybody was chatting with their co partners and enjoying their life. She felt a depressive burst and started weeping after seeing all these. A magic occurred there. Suddenly, a blow of cold air touched her cheeks and she heard some announcement there. She surprised and focused around her. Some body asked (God, obviously) “ hello, what happened to you, why you are weeping as everybody is enjoying today? She explained all her story that she is ugly, no body loves her and she feels alone every time. Then the un known sound said ok, do not worry, I will make you the most beautiful girl, when you will awake next morning. On the very next day, the girl got a new life of beautiful face and attractive personality. Wherever she went, people were attracted towards her and she made a lot of friends in a small duration too. The things were moving as usual. After one year, when again Friendship Day came, The God thought, let us see whether that girl is happy or not? So again he visited to her but astonished to find her sitting alone and quite. The God asked “ hello dear, now what happened to you? I have given you, whatever you desired, but I am observing that you are still not happy. The Girl replied that I found friends but they seems as just superficial one, they like my beauty and look. 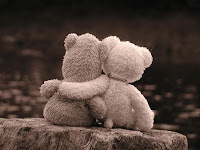 But I did not find any true friend here, who is close to heart and will accompany me in all situations of life. I met several Friends but missing something in each one and Iam not satisfied at all. God smiled and asked “ I want to tell you something, please listen carefully”. But, Not a single one in this world is being made perfect i.e who have all three qualities at 100% level. So everybody is incomplete here and search a friend or someone to make himself perfect and complete. So searching for friends or companion is our inherent need. 2. Now, I am explaining your case, when you were not attractive and had an average look, the cause of your depression was your unattractive face. Since your birth, You just seen your face but ignored the other good qualities, like your creativity, your aptitude and innocent heart. You never tried to put forward your good qualities to supersede your weak points. You were just searching happiness in outside world but kept deep depression inside. You could not understand the very truth of life that “ happiness starts , realized and ends inside heart only. There is nothing outside which is more attractive than your inner world and can give sustained happiness. Since you were living in a“sphere of being ignored” you could not understand the real truth of life. 3. Now take the second case, When you became beautiful, people came naturally to you by the laws of attractions, but few had true and proper time to understand your heart and read your qualities. So they were not just compatible to you and again you were unhappy in the same extent as before. 4. Please remember one important fact of life that “no one here is like a true friend or a fake friend”, as everything (human or material) is immortal and new creations overlaps on old ones and thus maintains the craze of life. You are gifted with a fixed time slot to realize the life and complete your aspirations. So rather than waiting for others to come, open yourself and explore your identity to make you complete and perfect, You start your own efforts to learn life, join others and try to be happy in all situations. So friends, do not ever think that, “God” has done any injustice with anybody. He has uniformly distributed his love and affection among all of us. However due to shadow of our ignorance, we are unable to understand his blessings and misunderstand life. Beauty is not skin deep, it lies inside, who ever said it, is very well said. Those who are searching their friends or life partners looking for their external beauty only will surely big fools. They are not only wasting their time but also closing their hearts for someone very aspiring inside but ignored only for the external beauty. So what are you saying? Those who are searching for their partners, my request is that don't waste your valuable time by looking for only beautiful glowing faces. Who knows inside it remains only fake and nothing else. You are gifted with a fixed time slot to realize the life and complete your aspirations. So rather than waiting for others to come, open yourself and explore your identity to make you complete and perfect, You start your own efforts to learn life, join others and try to be happy in all situations. I really liked these lines. Excellent! ya thats truw Raja, but He is the only existence and all others are just........So If I am here you are also here then He is obviously there my dear. no doubt about this. Ya it may varies person to person............Just my view, don't take seriously.